views on the current political crisis and the situation facing the left. Demonstration by opponents of the calls for a coup. March 14, 2015 -- TeleSUR English, posted at Links International Journal of Socialist Renewal -- Government supporters say the opposition is inventing a crisis in order to undemocratically remove President Dilma Rousseff, of the Workers Party of Brazil, from power. The political forces organising marches on March 15, 2015, against the democratically elected government of Dilma Rousseff began conspiring immediately after it became known that she had won the run-off election in October 2014 against the candidate of the Brazilian elites, Aecio Neves. The right-wing political opposition in Brazil has been reluctant to accept the results of that election, seeking to implement their neoliberal agenda by whatever means they can. The opposition, like their right-wing contemporaries in the rest of Latin America, have become frustrated at their repeated electoral defeats. The left-wing Workers Party (PT) has been in power since Rousseff’s predecessor, Luis Ignacio Lula da Silva, was elected president in 2002.
Who is behind the impeachment campaign? For more on Brazil, click HERE. September 16, 2014 -- TeleSUR English, posted at Links International Journal of Socialist Renewal with the author's permission -- A fortnight out from Brazil’s October 5 national election, the big news has been the significant surge in support for Marina Silva, a former Workers’ Party (PT) government minister and environmental activist, with some polls predicting she could end up winning the presidential race. Incumbent president and PT candidate Dilma Rousseff maintains a narrow lead over Silva, but the elections will almost certainly go to a second round run-off on October 26. 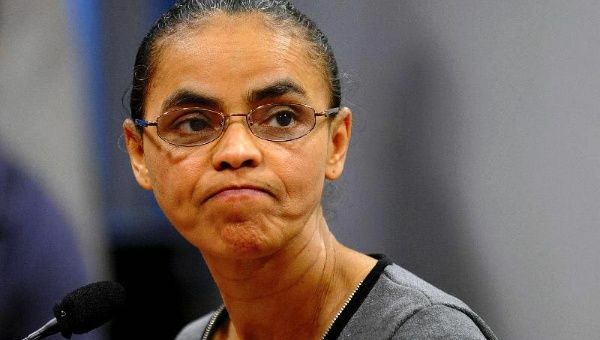 If this occurs, current indications are that Marina Silva has a chance of winning, a remarkable feat given that a little over a month ago she was not even a presidential candidate. July 1, 2013 -- Real New Network -- Brazilian protesters force compromise for improvements in public services. 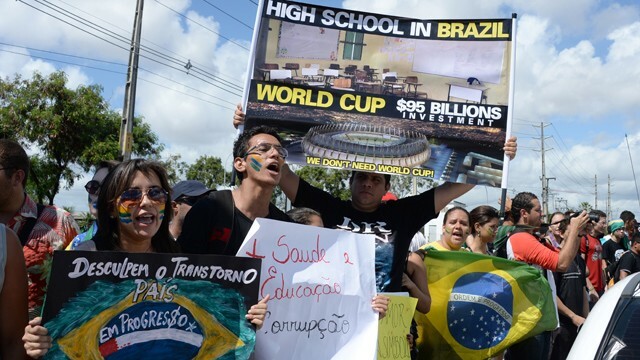 President Dilma Rousseff conceded many of the demonstrators' demands, and called for a national compromise to improve public services, by investing 100% of Brazil Oil revenues in education and health care. International Viewpoint -- This interview with João Machado was conducted by Juan Tortosa of the Swiss journal SolidaritéS on June 23 and June 27, 2013. João Machado is a member of the leadership of the Party of Socialism and Freedom (PSOL) and of the Enlace current within it. Luiz Inacio Lula da Silva with Dilma Rousseff. June 23, 2013 -- André Singer, the person who developed the concept of “Lulism”, says that the recent street protests have opened up a long cycle of mobilisations that will force the government and the country to make some crucial decisions. 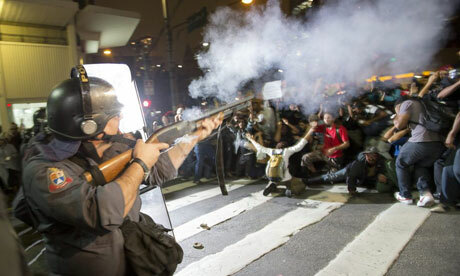 Military police fire on protesters in Sao Paulo. Photograph: Sebastiao Moreira/EPA. We were surprised by your invitation to this meeting. We imagine that you were also taken by surprise by what has occurred in the country in recent weeks. This gesture of dialogue on the part of the federal government is in contradiction with the treatment you have given social movements, a policy that has remained consistent through this administration. It seems that the uprisings that have spread throughout the cities of Brazil since June 6 has broken old barriers and opened new paths. From the beginning, the Free Fare Movement has been part of this process. We are an autonomous, horizontal and non-partisan social movement, that never intended to represent all of the protesters who took to the streets of the country. Our voice is just one more among those shouted in the streets, written on placards, scrawled on walls. In São Paulo, we initiated protests around a clear and concrete demand: repeal the fare increase. If previously this seemed impossible, we proved that it was not and have advanced the struggle for what is and always has been our central concern, a truly public transport system. That is why we came to Brasilia. June 23, 2013 -- Links International Journal of Socialist Renewal -- Brazil is changing! The youth uprising youth -- which has received active support from sections of the poorest people and more conscious middle classes -- has already had a greater impact on the history of the country than the "Collor Out" protest movement [of 1992, against then president Fernando Affonso Collor de Mello]. The current political system has fractured. And these facts are positive. We will be faithful to these developments, to borrow a concept from French philosopher Alain Badiou. Public transport ticket prices were the trigger. Now multiple issues are being raised. All of them progressive. The argument that all this will open up space for a right-wing coup is simply ridiculous. This argument, put forward by sectors that want to demobilise the protests and protect the Workers Party (PT) government, seeks to hide the fact that the position of President Dilma Rousseff's PT government and Rede Globo [one of Brazil's main TV stations] are the same. They are united in their defence of the regime and share the common goal of propping up the current economic model. Real News network report, June 24, 2013. More at The Real News. June 22, 2013 – Links International Journal of Socialist Renewal -- The massive protests across Brazil have taken everyone – even the instigating group, the Movimento do Passe Livre (MPL, Free Fare Movement) – by surprise. Some international lefties and political analysts have repeated mainstream Brazilian journalists’ claim that they are the most important protests since the end of the military dictatorship in 1985. This is false. In the midst of the largest street demonstrations Brazil has seen in decades, some of the country’s most important social movements – including the Movement of Landless Rural Workers (MST), the Unified Workers’ Central (CUT) and the National Union of Students (UNE) – sent the following open letter to Brazi’s president Dilma Rousseff on June 20, 2013. Translated by Federico Fuentes. This week, Brazil has witnessed mobilisations across 15 capital cities and hundreds of other cities. We are in agreement with the statements coming out of these protests, which affirm the importance of these mobilisations for Brazilian democracy, because we are conscious of the fact that the changes we need in this country will come through popular mobilisation. More than 1 million people protested across Brazil -- in at least 80 cities -- on June 20. See also "Open letter to President Dilma Rousseff from Brazil’s social movements; A succinct report from the MST". For more on Brazil, click HERE. June 22, 2013 – Links International Journal of Socialist Renewal -- The mass movement, that began as a protest against increased public transport prices, was unprecedented and surprising. Those who believe that they can immediately capture all its dimensions and future projections will most probably have a reductionist view of this phenomena, forcing reality to fit into previously elaborated schemas, in order to confirm their arguments, without taking into account the multifaceted and surprising character of these mobilisations. 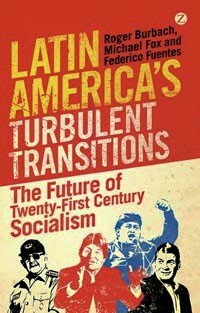 March 11, 2013 -- Climate & Capitalism, posted at Links International Journal of Socialist Renewal with permission -- Latin America was the first region targeted by the neoliberal phase of capitalism, and it suffered some of its worst consequences. But it is in Latin America that neoliberalism has been most contested in recent years by new social movements of landless peasants, Indigenous communities and urban unemployed. In a number of countries, this powerful democratic ferment has led to the election of anti-neoliberal, anti-imperialist governments — a process that started with the initial electoral victory of Hugo Chávez Frias in the late 1990s. Delegate addresses the national congress of militant Brazilian trade union federation, Contulas. 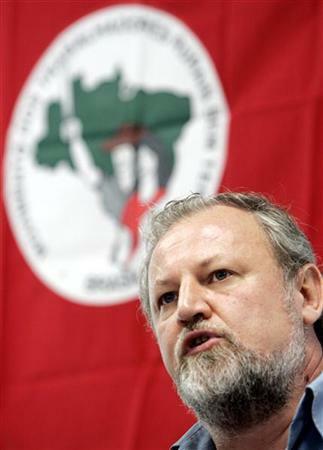 July 11, 2010 -- An attempt to forge greater unity among militant union sectors in Brazil has imploded. The Working Class Congress (Conclat) was held in Sao Paulo on June 5-6 to try and bring together various radical union currents. The key forces behind the congress were Conlutas and Intersindical, both formed in opposition to the main union confederation, the Unified Workers’ Confederation (CUT). The CUT unites approximately 60 million formal or informal workers out of a total population of 200 million, making it the biggest workers confederation in the continent. The CUT has had a very close relationship with the governing Workers Party (PT), both during its period of ascendency as it emerged out of the militant workers' struggles of the 1970s, as well as during its transformation to what it is today. Has the World Social Forum been co-opted by capitalism? Does it have a future? March 3, 2010 -- Olivier Bonford and Eric Toussaint are members of the International Council of the World Social Forum (WSF) and of the the Committee for the Abolition of the Third World Debt (CADTM). In this interview with Marga Tojo Gonzales, they discuss the future and role of the World Social Forum as it enters its second decade. 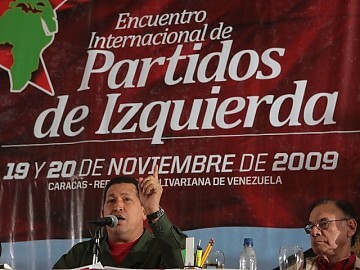 They also examine the relationship between the WSF and the call for a Fifth Socialist International by Venezuela's Hugo Chavez. Translated by Vicki Briault and Christine Pagnoulle. Marga Tojo Gonzales: Ten year after the first use of the slogan, "Another world is possible", a majority of humankind still lives in subhuman conditions, and with the international financial crisis, the situation has become even worse. Does this mean that the alternative globalisation movement has failed? February 1, 2010 -- Below is a translation of a news report that appeared in the January 31, 2010, issue of the Brazilian newspaper Folha de São Paulo. One of the most vexing issues in Latin America’s relations with Haiti is the grievous lack of understanding on the part of anti-imperialist forces about the nature of the repeated imperialist occupations of the former French colony, and of the crushing of the Lavalas movement, including the ouster of the country's democratically elected president, Jean-Bertrand Aristide. I understand that at least some currents on the Brazilian left -- for example the PSOL -- understand that the UN occupation of Haiti was really a US-NATO occupation. This became clear when the US put an end to the pretense and used the January 12, 2010, earthquake devastation and catastrophe as a pretext to directly occupy Haiti with US troops. However, to my knowledge, Brazil's Workers Party (PT) government has been silent on this issue. Its military has the lead role in the United Nations Stabilisation Mission in Haiti (MINUSTAH), misnamed to be sure. Bolivia also has troops in the same UN police force.